• relaxing on the dock or under a canopy of trees. • walking the shoreline and exploring our wooded paths. • bicycling miles of back roads through county & national forest lands. • sailing, fishing, canoeing, kayaking, and swimming off the dock. • exploring the many wonders of the area. • Kick back on our spacious grounds & under majestic old growth pines. 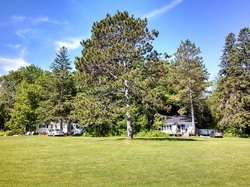 Nestled in the trees on the south shore of Lake Superior Bodin's Resort is a gem. We offer several options for accessing the lake, spacious lawns, fire-pits and a glorious view of the sunrise over the Chequamegon Bay. If you aren't an early riser, do not fear, the colors of the sunset reflecting off the waters are just as breathtaking. Due to changing water levels and wave action, our beaches may not be as large as some of the pictures show. Please understand that we do not have any control over the ever changing water levels and the impacts caused by Mother Nature! We will be working to repair our dock again in 2019. Book your vacation now! Click on the Reservations Tab and Check Availability button.